To celebrate the Year of the Dragon, Phoenix Chinese Week and the Arizona Go Club jointly sponsored the 2012 Phoenix Chinese Week (PCW) Go Open on January 29. 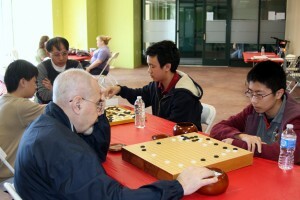 Twenty two go players ranging in strength from 18k to 8D gathered at the Phoenix Chinese Cultural Center to compete in four divisions, Division A (2D and above), Division B (3K to 1D), Division C (8K to 4K) and Division D (9K and below). After three rounds and nearly six hours of intensive competition, two winners were determined in each division. 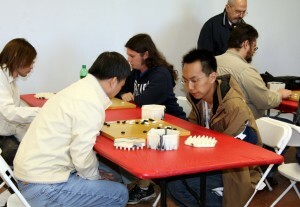 Chun-Hong Chen 8D demonstrated his superior strength by sweeping all three games and won 1st place in Division A, while Jeremy Cain 4D won 2nd place. The winners for the other divisions are: Division B: Jonathan Holtrop 1k, 1st place; William Gundberg 1k, 2nd. Division C: Howard Liu 6k, 1st place; Richard Hardy 5k, 2nd place. Division D: Marty Luad 11k, 1st place; Guillermo Molano 11k, 2nd place.